Kemp has already denounced Griffin to the local authorities and is watching for help to arrive as he listens to this wild proposal. When the authorities arrive at Kemp’s house, Griffin fights his way out and the next day leaves a note announcing that Kemp himself will be the first man to be killed in the “Reign of Terror”. 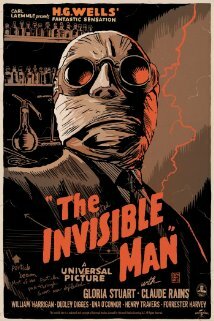 Kemp, a cool-headed character, tries to organize a plan to use himself as bait to trap the Invisible Man, but a note he sends is stolen from his servant by Griffin. Griffin shoots and injures a local policeman who comes to Kemp’s aid, then breaks into Kemp’s house. Kemp bolts for the town, where the local citizenry comes to his aid. Griffin is seized, assaulted, and killed by a mob. The Invisible Man’s naked, battered body gradually becomes visible as he dies. This entry was posted in Books and tagged Fiction, HG Wells, Science Fiction on February 3, 2015 by Blas.